A week ago, while at Shenandoah National Park, I saw a young adult black bear, but by the time I saw the bear, it saw me and quickly ran into the woods and out of sight. Unfortunately, there was not enough time to photograph the bear. That same day, a couple from Maryland told me that they go to the park several times a year and had never seen a bear until that day, and they saw three black bears. Coincidently, a friend said that he has been going to the park for over 25 years and had never seen a bear until three weeks ago, and said he saw three bears too. And finally, a friend that I work with saw a bear in the park a few weeks ago as well. Obviously, there have been more bear sightings than usual this year. What’s with that? 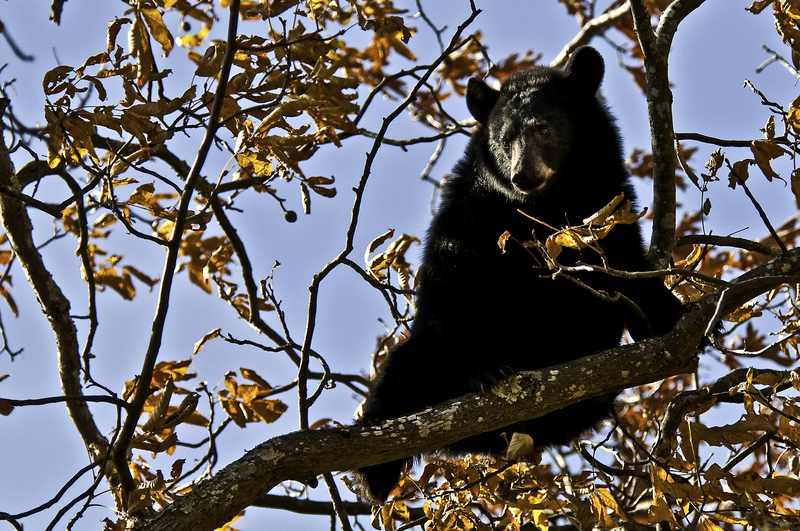 Last fall, while in Shenandoah National Park, I photographed a black bear 50 feet or more up in an oak tree. The bear was searching through the tree for acorns. It was amazing how high up in the tree the bear went for acorns, and there were not many acorns in the tree to be found. 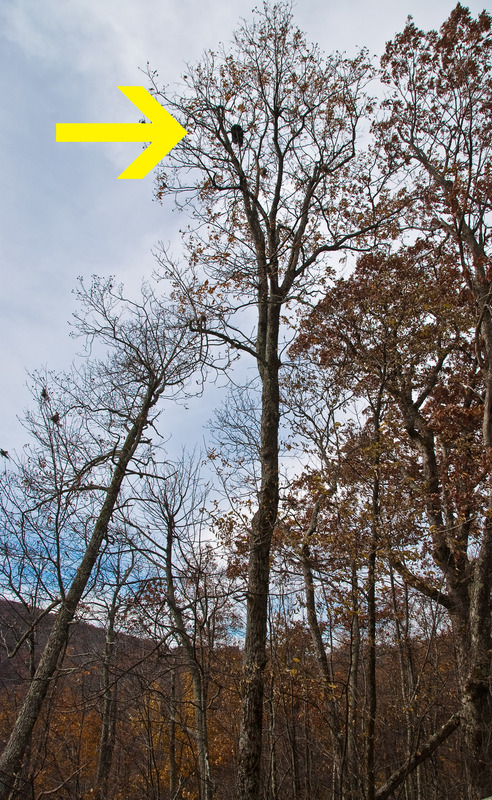 The below photo shows (arrow pointing at the bear) how high up in the tree the bear was located. The next image zooms in on the bear’s silhouette as it worked its way toward an acorn. Notice what is just above the bear’s nose, and how it was balancing precariously on the branch. After switching lenses, the next image shows the bear “eyeballing” a tempting acorn, but the challenge was getting to it. Notice the thin size of the branch as compared to the size of the bear. Finally, below is a close up of the bear. Timing is almost everything to capture images like those above. I hope I am fortunate enough to time it right again this year. Also, lesson learned, do not ever climb a tree to flee a bear. 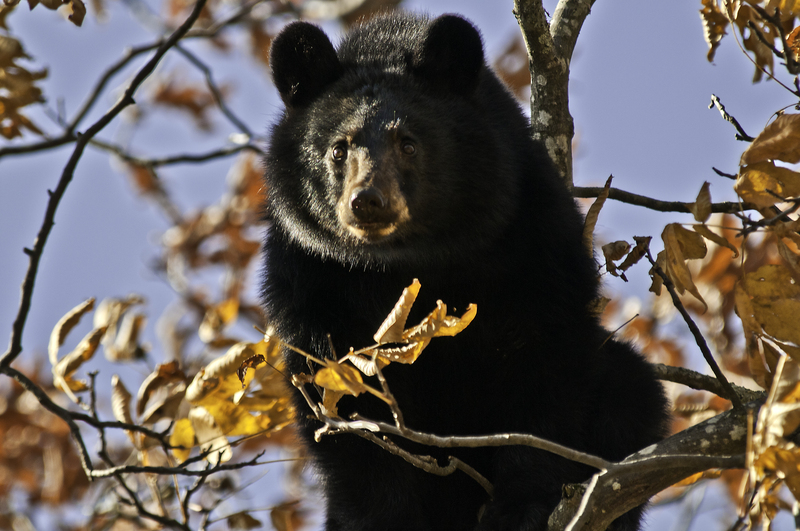 This entry was posted in National and State Parks, Shenandoah National Park and tagged black bear, Shenandoah National Park. Bookmark the permalink. 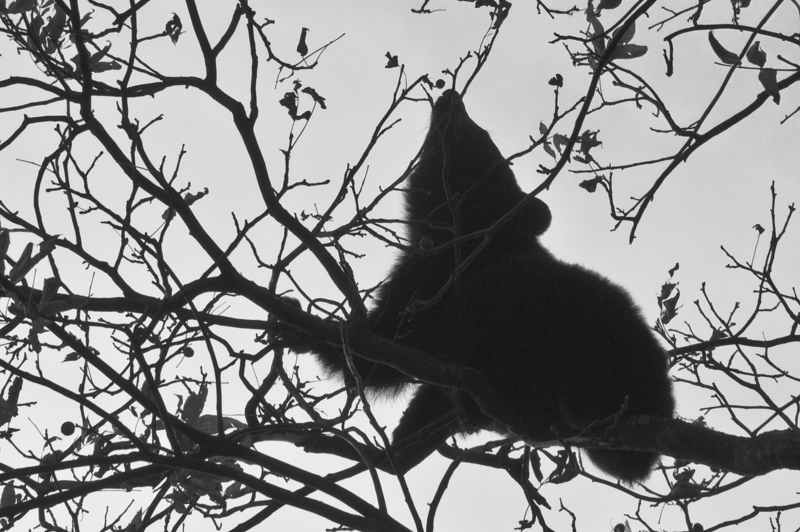 Having tasted acorns, I think this bear had to pretty hard up for something to eat to climb that high….. Very interesting post and nice shots. Very funny end line … and doubt that I’d ever be able to climb a tree even if a bear was chasing me. It is pretty amazing that you were able to get so many shots of the bear after reading how skiddish they are they. Love your commentary and photos and be careful walking in the forest! My son’s boy scout leader was in Cades Cove about a month ago with his family. They were biking the path with lots of other tourists when they came upon a tree with 5 bears in it!! They saw 15 during the weekend! They also concluded that climbing a tree was not a good way to escape a black bear (the only bears that climb). Great shots of this one! Saw 4 bears last Sunday hiking on Dickey Ridge Trail loop. Thought that was a lot for a trail so close to entrance of Skyline Drive but was quite exciting! yet effective. A lot of times it’s challenging to get that “perfect balance” between usability and visual appeal. with this. In addition, the blog loads super fast for me on Chrome.